Top Electrician Cincinnati: A Few Fun Electricity Facts! 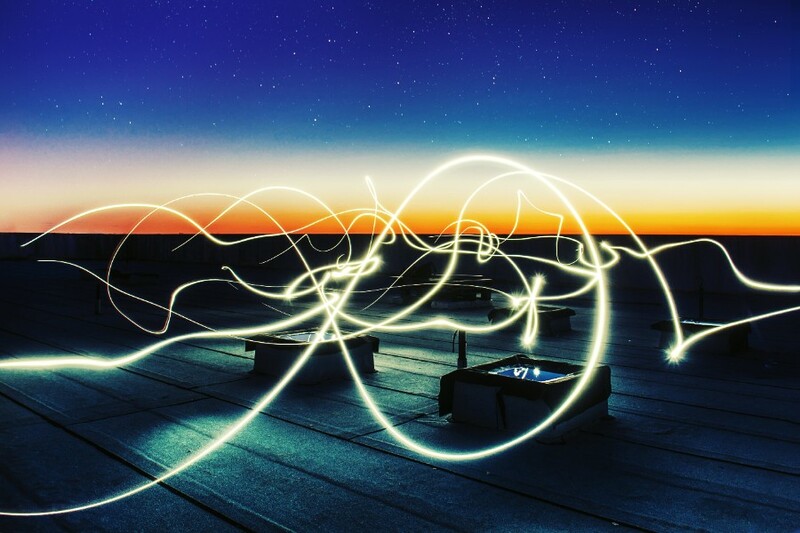 We are back with another blog about all things electricity and electrician-related! Over the past several months, we’ve been focusing most of our energy on discussing HVAC repair, maintenance, installation, and other related subjects. But, after all, our name is ElectricMasters, so we feel the need to get back to our bread-and-butter service. That said, today’s blog is all about offering up some interesting, random, entertaining, and perhaps even some practically useful facts regarding electricity and electricians. Usually, we’ll hone in on the “practical” side of things, with blogs about HVAC maintenance tips for your 2019 spring cleaning, why regular HVAC maintenance in Cincinnati is crucial, or even a few signs you need a new electrician. So, in the spirit of variety, we are going to shift gears a little bit in today’s blog! 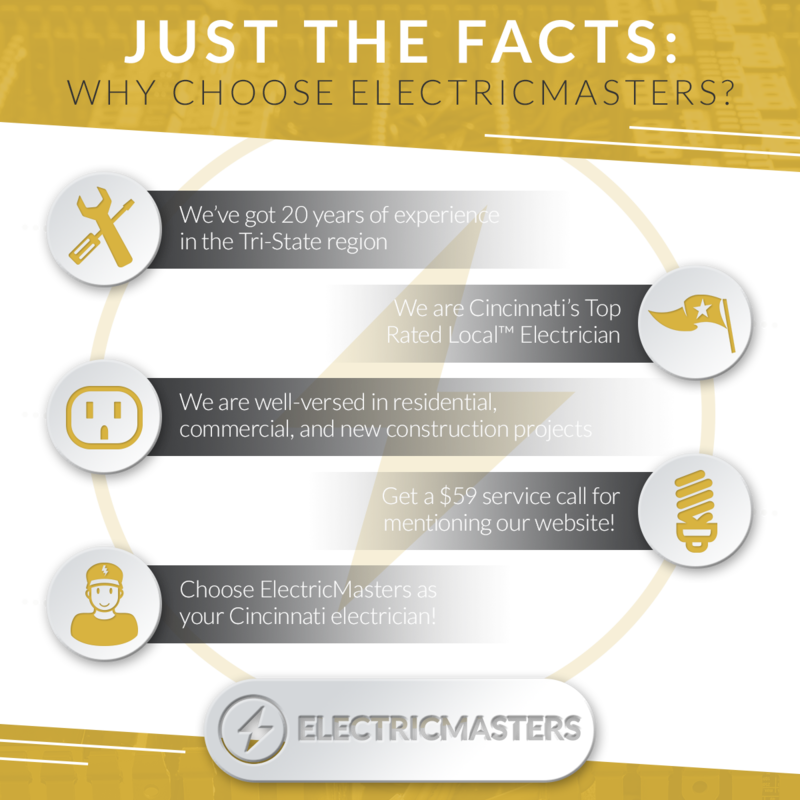 Before we dive into the meat and potatoes of listing of the aforementioned fun facts, however, allow us a few moments to describe who we are and what we do at ElectricMasters of Cincinnati. We are a Cincinnati licensed electricians that specialize in all of your electrical needs, both home and business electrical. We’ve got 20 years of experience in the Tri-State area, providing residential, commercial, and new construction electrical services. We are also known for our availability, as we are the top Cincinnati emergency electricians. If you need to talk to an electrician immediately, stop reading this blog and give us a call — immediately! We are also HVAC specialists, although we wouldn’t hold it against you if you didn’t deduce that from our name (ElectricMasters, in case you’ve forgotten in the last 30 seconds). If you are in need of trustworthy, affordable HVAC services in Cincinnati, we offer commercial and residential heating and cooling repair, installations, and maintenance plans. HVAC maintenance is highly advisable for a wide variety of reasons. To learn more about what we offer and what your home or business stands to gain, check out our dedicated resource on HVAC services in Cincinnati! Facts About Electricians & Electricity! Now that we’ve gotten some of the formalities out of the way, it’s time to dive into the meat and potatoes of said facts! Electricity Was Not An Invention – No, humans aren’t able to invent a raw power so, well, powerful. Electricity was discovered, more accurately, since electricity has already existed in nature long before we were able to harness its power! Electricity Is In You – Not only is electricity found in nature (we are all thinking of lightning right now), but it’s also keeping you alive. Electricity plays a crucial role in making sure your heart beats, which is fairly important as bodily processes go. More specifically, electricity causes the heart’s muscle cells to contract, which in turn makes your heart beat. Benjamin Franklin Gets More Credit Than He’s Due – Sure, Benjamin Franklin was very helpful in terms of his work which established a relationship between lightning and electricity, but he is hardly the individual who “discovered” electricity. It was the ancient Greeks, around 600 B.C.E, who unearthed that when fur and amber are rubbed together, they are attracted to one another. Does anyone know what that phenomenon is called? Bueller? Static electricity! Let’s Talk About Lightning – Lightning is incredible, but also pretty terrifying. It’s remarkably powerful, registering up to 3 million volts! It’s also remarkably fast as well, moving around 130,00 mph! As you can probably imagine, it’s remarkably hot as well, reaching temperatures as high as 54,000 degrees Fahrenheit. That’s why we stay clear of holding up metal poles in open fields during thunderstorms here at ElectricMasters! (And you should too). The Kingdom Animalia & Electricity – The animal kingdom has harnessed the power of electricity in numerous ways. The most commonly-thought-of example would probably be the electric eel, which has three organs utilized to create a current. The current is usually used to stun prey while the eel is hunting, but it can also be used to emit a high voltage current to dissuade predators from thinking they’ve found their next meal. So, whether they are the hunters or the hunted, electricity is key to the electric eel’s survival! Daylight Savings & Energy Conservation? – Here’s a little-known electricity fact for you: daylight savings time was a measure proposed during World War I as a means to save electricity, with the theory being that people would use less energy to light their homes if we catered our clocks to the sun’s schedule, as it were. However, a 1970s study found that it only made about 1 percent of a difference. While 1 percent is nothing to turn your nose up at, we aren’t sure it’s worth the trouble anymore. We think Arizona’s abstaining from the daylight saving’s program altogether is the right kind of idea. . . not that anyone asked us. . .
Electricians Can’t Be Color-Blind – Our final fact has less to do with electricity as a whole and more to do with electricians! Because all single phase electrical wires were red, black, and green up until the 1970s, electricians needed to be able to differentiate between the three. Hence, you could not become an electrician if you were color-blind, sad as it is, due to the dangerous nature of literally getting your wires crossed! Whether you need electric services related to residential, commercial, industrial, or new construction sites, we’ve got you covered at ElectricMasters. We’ve been in this business for a long time, which gives us the experience that counts when diagnosing and repairing electrical problems. Give us a call today!